Experience the natural landscape of the Machu Picchu region in different ways on this 4-day adventure trek from Cusco. Some activities, such as hiking and biking are included, while you can upgrade to add rafting and ziplining. This jam-packed itinerary is prearranged with transport, accommodations, most meals, and much of the gear for your experiences included so you can focus on enjoying the trip and taking in the scenery. The adventure starts with pickup at your Cusco hotel, where a vehicle takes you into the countryside with a stop for a meal at a bed and breakfast. At the top of Abra Malaga, get fitted for a helmet, gloves, and mountain bike to descend through the Incan Valley. Choose to upgrade for a whitewater rafting tour. The group meets to spend the night at a Santa Rosa ecolodge. On the second day, hike on the Inca trail past farms growing coffee, pineapples, and other fruit. As you descend to the village of Quellomayo, your guide points out local flora and fauna. The trek encompasses a suspension bridge, waterfalls, rivers, and a cable train, ending at the Cocalmayo hot springs. Spend the night in Santa Teresa. Start the third day on a zipline (available by upgrade; reserved in advance) or with a hike to Hidroelectrica where the group meets for lunch at a cottage on Machu Picchu’s flank. Walk the railway path through the jungle to Aguas Calientes for dinner and rest. Begin your trek to Machu Picchu on day four to catch the sunrise. Meet a guide for a 2-hour tour of the sanctuary, followed by free time. 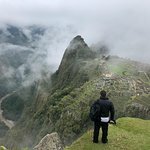 If reserved in advance, hike to Huayna Picchu (own expense). Return on your own to Aguas Calientes to catch the return train to Ollantaytambo, or opt to spend an extra night on your own before returning to Cusco. Walter was an excellent guide! Definitely a tiring tour, but amazing! Thanks a lot Bradley for your comment. We are so glad that you have had an amazing experience with us. Sorry for the inconveniences about the briefing at your hotel. Hope you've enjoyed Peru at maximum! Best regards, Conde Travel. Thanks a lot for your comment! It was a pleasure to make your dream into reality. We wait for you to continue discovering our amazing country with us. Best regards! Conde Travel. Thanks for trusting us, Olga! It was a pleasure (: Best regards, Conde Travel. Thanks a lot for your comment, Aline! Jimmy is so glad to hear from you. Thanks for recommending us. Best regards, Conde Travel. Get quick answers from 4-Day Classic Machu Picchu Inca Jungle Trek staff and past visitors.